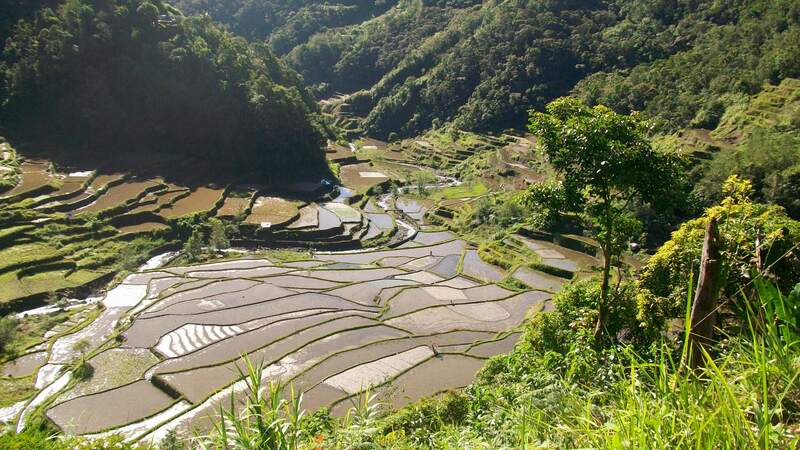 While other people were settling down to Valentine’s Day dinners, my friend Michelle and I set out on a 4-day adventure to the romantic rice terraces of Banaue and Batad. Taking the 8-9 hr night bus from Manila to the Northern part of Luzon was not something we were looking forward to very much, but was the only real choice if we wanted to see the spectacular terraces that the Filipinos bill as the 8th Wonder of the World. Pretending to sleep upright on cramped seats we drove through the night until the 8am arrival in Banaue. With a tad more energy than expected, we had the day free to explore the town, grab a quick nap, and take a short tricycle ride to the rice terraces viewpoint. The terraces were everywhere and lived up to the many tourist posters that you see all over the Philippines. 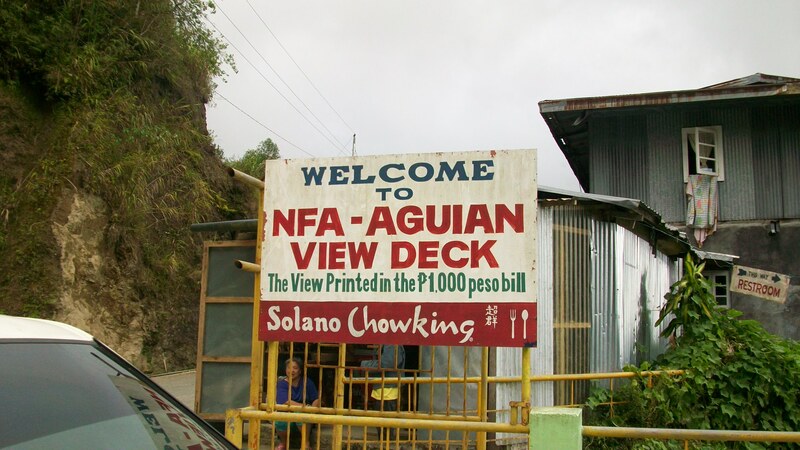 From one of the viewpoints, they actually pointed out the view that is printed on the back of the 1000 Peso note. That evening we ate an early dinner at the Greenview Restaurant, struggling to stay awake past 8pm. Both lunch and dinner had been pretty good…fresh vegetables and decent choices that quite honestly I hadn’t expected in a such a remote area of the Philippines. 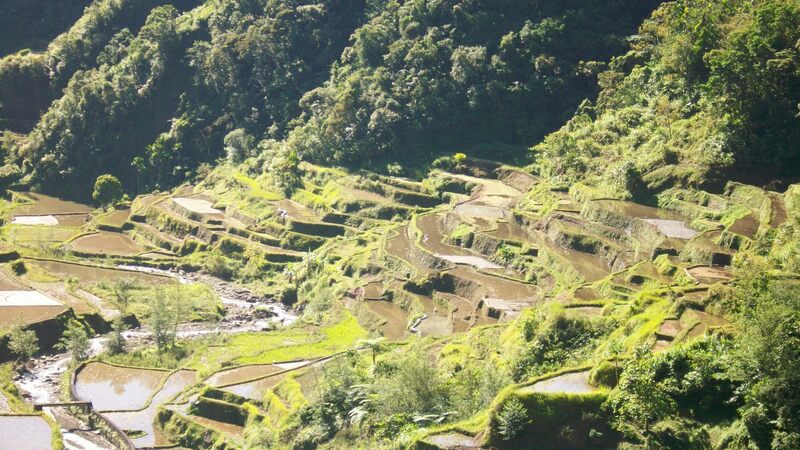 The next morning our guide picked us up and we transferred to Batad, via private jeepney, a journey of about 14kms. With only partially paved and winding roads, unexpected roadworks and other obstacles, the bumpy journey took over an hour. Our guide dropped us at the trailhead where it met the national road and we started our 45 minute descent down to the village of Batad. An easy ramble. The biggest hiking challenge to date had been trying to get reliable or complete information on the kind of trails and hiking offered in the area. 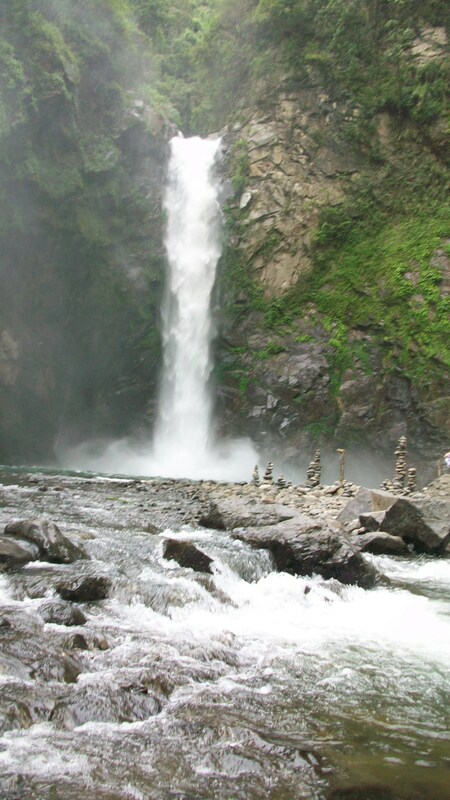 Most of the guides and tourist offices have their preferred packages and it was hard to ascertain what was really being offered and whether or not we wanted what something different. The fear was that hiking wouldn’t feature enough on the agenda and this easy walk made us a little suspicious that we might be right. 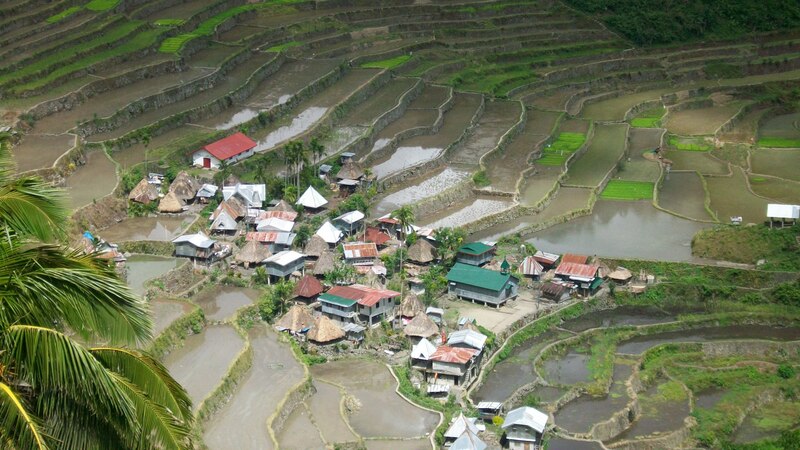 When we arrived in Batad we found it unspoilt, simple and charming in its own way. It was a bit like stumbling on a secret place, a very small hamlet with about 30 buildings, a couple of hotels and restaurants and a handful of hikers. The view from every position was of the rice terraces and we had an early lunch at our little pension and enjoyed it from their terrace. The accommodation itself was described as “basic”, a word which means different things to different people. 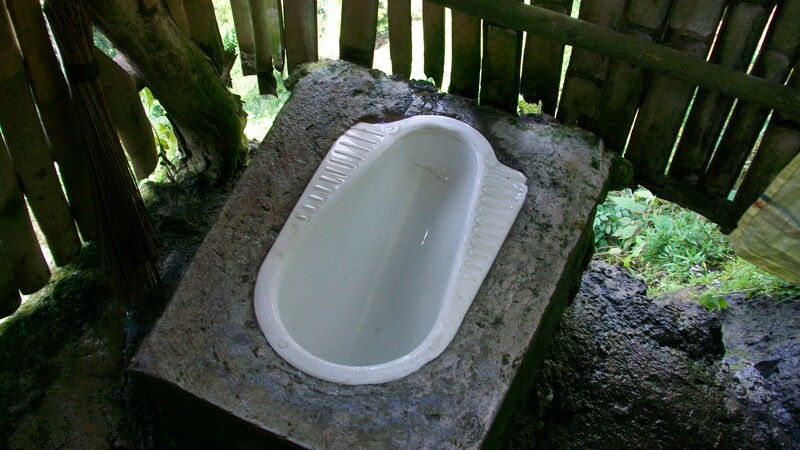 Here is meant a communal bathroom with no hot water; small rooms with only a bed, door and plywood partitions; ceilings that didn’t quite touch the walls, and a little wildlife (read: night time bugs and a visiting cockroach in our room.) Not for everyone, but everyday living for millions that I could surely tolerate for one night in exchange for a rare opportunity to see such a special place. In the afternoon we headed out for 2-3 hour hike to the Tappia waterfall. I had been warned that it was a tough hike, and having not done any real hiking since 2010 in Arizona, I was feeling it! We walked along the terrace walls, descending down the stone steps that helped workers travel from one terrace to the next. 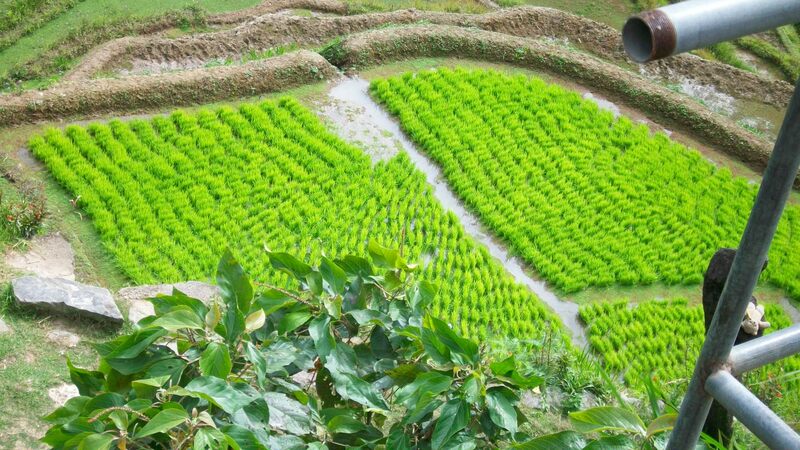 Up close we could see the rice paddies in their various stages of development. Most were unplanted at this time of year, but many had nurseries with young seedlings ready to prick out in the flooded fields. Some were already planted for the season, and some were abandoned. (Volunteer restoration is ongoing now to save some of the abandoned terraces that are starting to collapse.). Once we reached the saddle and, after a short rest, we descended the steep slope on the other side of the mountain down to the valley floor. Tappia falls came into view and I wobbled down the last 200 meters of steep steps as my legs started to seize up from 500 steep steps down. We rested for about an hour to enjoy the water and cool down. As you can imagine, the hike back was hard work, but actually a bit easier than the descent, helped by the rains that started as we began the trek back. 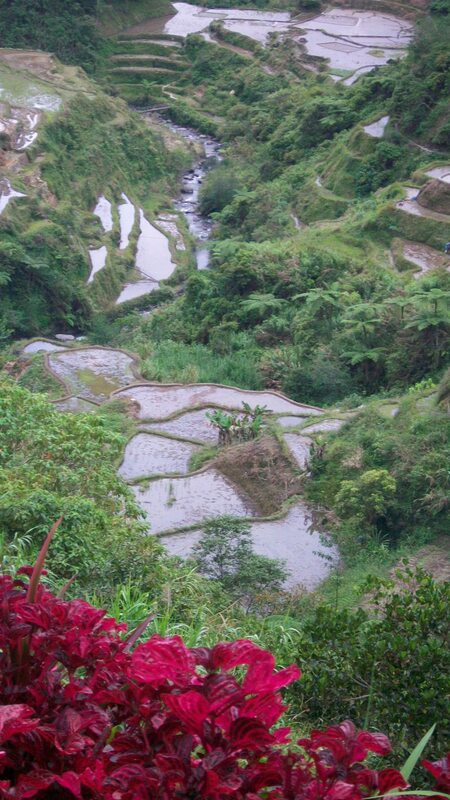 Beautiful views, a challenging hike and the satisfaction that we got to actually experience the terraces close up. A wonderful experience.